In this tutorial we will use the MM-PBSA method to calculate the binding free energy for the association of two proteins. The overall objective of the MM-PBSA method and it's complementary MM-GBSA method is to calculate the free energy difference between two states which most often represent the bound and unbound state of two solvated molecules or alternatively to compare the free energy of two different solvated conformations of the same molecule. The entropy contribution can be found by performing normal mode analysis on the three species but in practice entropy contributions can be neglected if only a comparison of states of similar entropy is desired such as two ligands binding to the same protein. The reason for this is that normal mode analysis calculations are computationally expensive and tend to have a large margin of error that introduces significant uncertainty in the result. The average interaction energies of receptor and ligand are usually obtained by performing calculations on an ensemble of uncorrelated snapshots collected from an equilibrated molecular dynamics (MD) simulation. In this tutorial we will demonstrate the use of the MM/PB(GB)SA scripts included with Amber and AmberTools to automatically perform all the necessary steps to estimate the binding free energy of a protein-protein complex (RAS and RAF) and a protein-ligand complex (Estrogen Receptor and Raloxifene) using both MM-GBSA and MM-PBSA methods in serial and parallel. Furthermore, we will be demonstrating the use of Alanine Scanning and Normal Mode entropy calculations using the script. 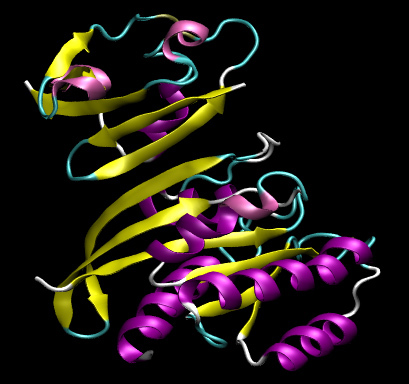 In principle, the calculation of the binding free energy described above would require three independent MD simulations of the complex and both individual proteins. However, typically one makes the approximation that no significant conformational changes occur upon binding so that the snapshots for all three species can be obtained from a single trajectory. This is the 'single trajectory approach' and is what we will use in this tutorial. Section 1 : Build the starting structure and run a simulation to obtain an equilibrated system. Section 2 : Run the production simulation and obtain an ensemble of snapshots. Section 3 : Calculate the binding free energy and analyse the results (tutorial forks here between different versions of MM/PBSA).